The clutch is found in manual transmission vehicles. This transmission component links with the clutch pedal and helps with the smooth transition of gears. The clutch master cylinder is the heart of the clutch system. When you press the pedal, the master cylinder builds up the pressure, using the concept of hydraulics. Given the nature of hydraulics and the cylinder’s frequent usage, it would be no surprise if the clutch master cylinder wears out. Due to its frequent usage, the master cylinder can wear out. The fluid inside can leak and you could experience problems with pressing the clutch pedal and ultimately in shifting gears. Usually, a failing master clutch cylinder will bring up issues that can easily be identified and looked after by a mechanic. It is often believed that a car is useless without the numerous fluids in work in its system. If any one of the fluids is compromised, meaning it reaches critical levels, your car can start acting strangely. The same is true for the clutch fluid, which ensures you are able to shift gears effortlessly if it goes low or gets dirty, your entire clutch system could deteriorate. The dirt mixing with the liquid is not a very common phenomenon, however, it can happen if the small rubber seals inside the master cylinder break into pieces due to overuse. These rubber fragments break away into small fragments mixing up with the liquid. Not only that, but these fragments can sometimes choke the clutch fluid container, completely disabling you from pressing the clutch to shift gears. As soon as the clutch’s function fails, the next system to get affected is the transmission. You absolutely need the clutch to help you with shifting, without it you will either not be able to shift at all or you will face difficulties shifting. The master clutch cylinder ensures hydraulic pressure is maintained throughout the shifting process, therefore, if it fails, the proper pressure won’t be created and you would struggle with shifting. However, this same symptom can arise if you are low on transmission fluid. As we said before, the car is full of different kind of fluids. It is entirely possible that the transmission fluid leaks and you are worried about the clutch master cylinder leaking. Therefore, always visit a mechanic if you are feeling even the slightest hardship in shifting gears in your manual car. Automatic cars usually do not have such issues with the transmission. Ultimately, the effect of a failing clutch master cylinder comes on to the clutch pedal. The clutch pedal is where you can feel the effects of a failing master clutch cylinder. Two major issues can arise from this. Either the fluid levels are low and you feel the clutch is very soft, in which case you should replace the clutch fluid, or the clutch fluid levels have depleted completely, which means your clutch pedal won’t come back up after you have pressed it. Both problems are pretty serious in nature and require the immediate attention of a certified mechanic. Always remember not to stall any repairs, or else the problem can get worse. The most prime way to enhance the functions of a mechanical car part, such as the master clutch cylinder, is to clean it diligently, especially when the component is contaminated. The clutch master cylinder, as mentioned before, can get possibly contaminated by a broken rubber seal. To cleanse it you need a number of amenities including tools and cleaning equipment. Removing the clutch cylinder is a bit difficult since it is located in the lower part of the engine bay. In order to get to it, you need to slide under the car after raising it using a jack and a few trusty jack stands. Normally, we are not skillful enough to locate or remove a clutch master cylinder. But if you are most adamant about doing this work yourself, it is better to first learn the work from a mechanic. For first-timers, this is the best choice, others who have learned the art can proceed to remove the clutch cylinder from the bottom of the car. Beware, there is a slave clutch cylinder as well in the same area. You wouldn’t want to mess that up while you are removing the master cylinder from the setup. Any aerosol cleaner will work brilliantly in cleaning the entire cylinder. Make sure to first disassemble its parts and wash them with clean water, before you attempt to apply the cleaner. Once you are done cleaning each and every crack in the cylinder, add new rubber seals and let the component dry. After it is dry you should assemble it back together and start with reinstallation. To reinstall the master clutch cylinder, you or your mechanic has to repeat the same process used to remove the cylinder component from the car. 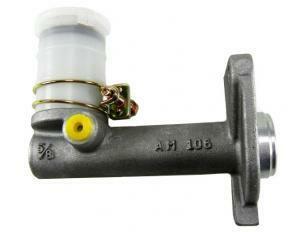 The master clutch cylinder can disintegrate due to constant use and negligence of repair work. In such cases, any repair is not possible. That is when you have no choice but to get a replacement part. Replacement parts can be expensive and they can be cheap, but it all depends on your car’s make and model as well as the part’s availability in the market. You can always remove the option of replacement if you are a regular visitor to the mechanic. Those of you who are stall or procrastinate when it comes to car repairs have to pay a huge price later in the form of replacements. Usually, a brand-new master clutch cylinder costs $100 – $200. On top of the price of the spare part, you have to pay labor costs. The labor cost depends on the mechanic. If he is a certified mechanic then he has earned the right to charge you exorbitant amounts. On average you could expect to be charged $80 – $100 in labor costs.